Recently, in my ongoing researching of maps, I discovered that before the 15th century, the word “map” did not exist. Instead, what today we consider to be maps were referred to in the centuries preceding the 15th, as “diagrams”. This makes a great deal of sense because cartographic accuracy was less important than the graphic depiction of spatial relationships between not only geographic features but between social, cultural and religious values and symbologies. During the Medieval period maps were produced to depict a particular event or occasion unlike our contemporary notion of a ‘generalised’ map of a territory. Medieval maps included written descriptions and were often accompanied by written itineraries on scrap pieces of parchment that often listed the successive places/sights along the route. 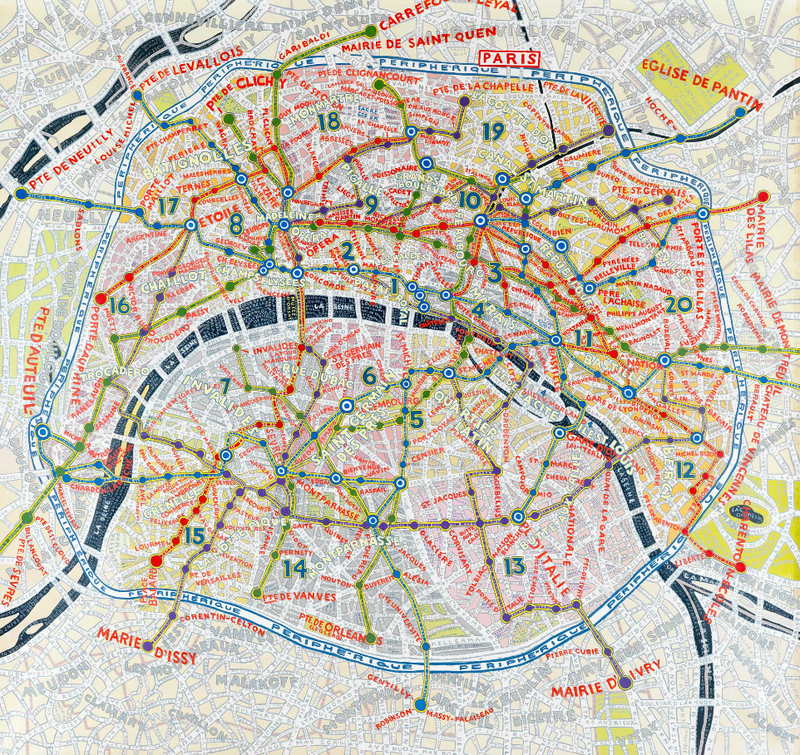 These maps were narrative in nature, and combined history, memory and experience to diagram place. This format of mapping is similar to our contemporary notion of a mental map which I have written about before. What I am really interested in is the notion of a diagram and its use to map the layers of place. In its most general sense a diagram can be defined as a two dimensional drawing or sketch designed to show how something functions. It has commonly been associated with architectural practice. Gregory Cowan defines the diagram as a “visual representation of the way something works, rather than how it looks. It is an abstraction and a reduction of something. It is a mode of notation, but also a model of thought.” Cowan’s definition posits the diagram as a method which requires interpretation instead of being merely a tool for illustration. Subsequently, Anthony Vidler proposes that the diagram is performative rather than representational and operates as a space of possibilities between interpretation and reality. In a society where we can google earth immediately and see bird eye’s view of geographic landscapes in seconds, Medieval maps offered a narrative to the landscape which did require the viewer’s interpretation of landmarks, commentary and symbols. Looking at the Medieval maps, I thought their was a strong resonance to Swedish artist Öyvind Fahlström’s later map paintings. Fahlström was interested in resistance and excess and diagrammed the clashes between the two extremes. For him, a map was governed by rules but was also an open territory for imaginary interpretation. I also thought of Bureau d’études a Paris-based collective founded in 1998 by Léonore Bonaccini and Xavier Fourt. The ‘bureau’ produces maps that depict relationships and ownership ties between transnational organisations and companies. They diagram the links between think tanks, financial firms, regulatory bodies, intelligence agencies, media groups, networks of consumer distribution, weapon makers, and satellite companies. Artist Stephen Walter uses historical information, trivia, local knowledge and stereotypes of the area he is creating a map of. Walter focuses on the etymology of place names and local histories, taken from online sources and publications and reveals a myriad of words and symbols and exploits the micro and macro cosmos of the world we live in. 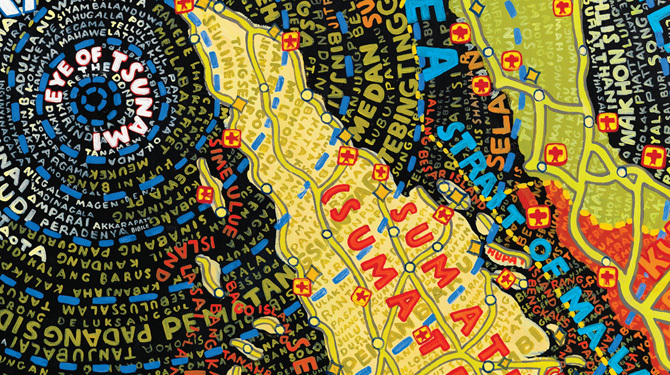 Designer and artist Paula Scher painted large maps that depicted continents, countries, and cities with layers of information, place-names, and provocative cultural commentary.